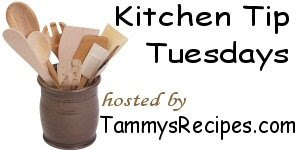 Kimspirations: Kitchen Tip Tuesday - Soup's On! While it did warm up here for a few days, it is back to being frigid again. During these cold spells, I really enjoy a good hearty bowl of homemade soup. Today, however, I am not going to talk about homemade soup...I'm talking about canned soup. Last week one of our grocery stores had a dollar sale. They had Campbell's Ready to Serve soups on sale for $1 each. We picked up a LOT of them. Now for easy no-fuss meals when we are in a hurry, we can simple heat up a few of these, serve some easy Focaccia bread or a side salad and we have a meal! As these are not condensed soups, even if we had to use 3 tins, the cost is only $3 plus whatever we serve with it (bread, crackers or salad). That's a nice inexpensive meal and it is also nice and light. For more great kitchen tips, check out Tammy's website. A dollar each is a good deal for those soups! I know they are expensive. I often see coupons for them, too. I love campbell's soups. I practically lived off chicken noodle when I was a kid.